Have you thought about the words you use the most? I think most of us just blah, blah, blah for the most part, not really giving it much thought. At least not until later. But, some words are lifting, while others are sinking, and whether alone or linked together, their meaning and effect can make us or break us. 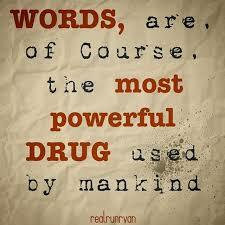 Because they have great power, no word is ever inconsequential. So words matter, undoubtedly, and our vocabulary speaks volumes about our mindset, as it echoes the good, the bad, and the ugly inside us. Nunca ha llovido que no haya escampado. What words do you bank in your vocabulary? What kind of statements do they make? Family and friends, may God always give us the clarity to think the right words, and the wisdom to choose the right time to use them. My dearest Connie, you are an inspiration to All of us.. My friends from childhood have always stood by me and they continue to stand by me!. Love you all so very much!!! Right before reading your message a co-worker asked for my advice on a personal matter based on my belief in God and Jesus Christ. Timing is everything…let God do the talking, I pray that it worked. Good going, babe, I pray it works too. I know I sound like a broken record, Amiga, but I do love this blog!